Biologist, coordinator and founder of Ocean Sounds, specialized in Bio-acoustics of marine animals. Born in 1969 in Germany, studied Biology at the FU in Berlin until 1998, when she decided to immigrate to Northern Norway. 1999-2003 studied Arctic Biology and Physiology at the University of Tromsø and worked as a seasonal whale watching guide. Received her Masters of Science at the University of Tromsø, Norway in 2003. She moved to Henningsvær on Lofoten in February 2004 and founded Ocean Sounds in August 2005. 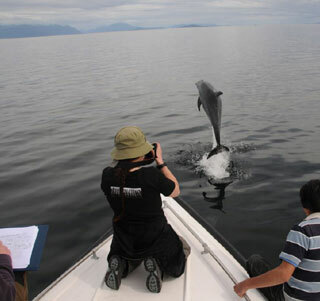 During the winter months 2003-2008 she studied Killer Whales in northern Norway. Currently, she is working on her PhD thesis – on the vocal behavior of killer whales – in cooperation with the Cognitive Ethology Group at the University of Göttingen in Germany.